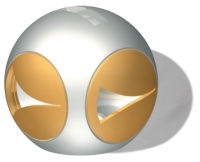 Accuracy: The Unimizer® eliminates inaccuracy in ball valves. This is made possible with the technology of the Griswold parabolic flow OPTIMIZER®, a device inserted into the ball to achieve Equal Percentage Control Characteristics. Lower Cv Ratings: Why choose a ball valve over a globe valve? 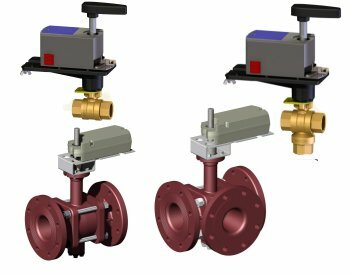 With the Unimizer® you can achieve the low Cv ratings of a globe valve at the low price of a ball valve. You can get the added benefit of higher close off pressure. Compatibility: The Unimizer® is available in Female or Sweat threaded end connections. The Unimizer® sets the standard for compatibility, and Griswold’s Universal Solution offers the widest range of actuator choices in the industry. Griswold Controls’ Patent Pending 3 Way Ball: Many manufacturers settle for providing non-equal percentage control to the coil, or they achieve equal percentage control by using a costly, custom programmed actuator. Griswold Controls’ Unimizer® achieve true equal percentage flow from the parabolic shape of the Optimizers® located at each port, thereby allowing the use of any standard, low cost actuator. 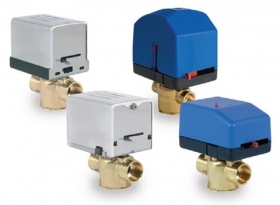 Erie’s motorized hydronic valves, the PopTop™, provide convenient, reliable and easy installation for a variety of heating and cooling applications. Installation is a snap with easy, one-handed removal or engagement of the actuator to the valve body. Push the button and lift. It’s that simple.